Being a mother these days is really taxing more than we could ever imagine. We have to deal with all so many matters all at same time – monitoring our kids’ activities at school, with gadgets, dealing with their physical and social media involvement, etc. and moreso keeping an eye, making sure they’re healthy all the time. In my 16 years as a parent, I really find the latter harder to do especially that I am not in control of the viruses and diseases that are just lurking around ready to attack my children. What is more alarming is that – viruses and diseases these days have perilously evolved to pass on stronger and more aggressive strains that can pin our kids immune system down in no time at all if we’re not extra careful. And if I may put it Filipino, “ang mga sakit, madaling makahawa, mabilis lumala at mas nagtatagal”. I genuinely believe in the old idea of ‘prevention is better that cure’. While I also allow my kids to experience pizza, burgers and soda once in a blue moon, the utmost part of their diet are really veggies and fruits done in whatever I thought kid-palate worthy possible just so I can work around prevention of virus aggression. But then I’m just a paranoid mother that can’t get enough of my usual preventive routine. I want to make sure my kids are 100% shielded from viruses and diseases so I always spend and gave them vitamins and supplements. And just like Juday, when it comes to Vitamin C supplement I only trust one brand - Ceelin Plus. Ceelin has been my kids’ health partner for 16 years now! My three children, the oldest of them is 16, the middle child is 10 and the youngest is 7, has taken Ceelin from oral drops, to syrup to chewables and back to syrup again whenever the latter is out of stock since I can remember. Through the years of my brand loyalty, I have witnessed Ceelin’s evolution, from packaging to variety to flavour and now its formulation. I find this very apt because viruses and diseases are changing, we need something more than our usual to get our kids protected. Now, Ceelin Plus is formulated to have a distinctive ZincPlusTM technology property that combines the right levels Vitamin C and Zinc in a liquid format giving it an improve vitamin C stability. This power combination results in dual immunity boosting action that provides a stronger and tougher immune system for our kids. Vitamin C and Zinc found in Ceelin Plus protects our kids from getting sick and when taken everyday can reduce the severity and shorten time of sickness. Every mom out there is the same, we want the best for our kids and we don’t want them to get sick. Ceelin Plus is the best way to go with it! 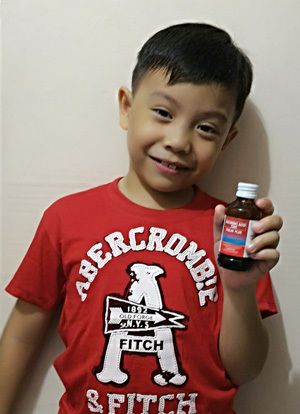 Ceelin Plus is another quality product of UNILAB, Trusted Quality HealthCare. Angelo, my youngest, is a Ceelin kid ever since. He progressed from oral drops to syrup to chewable and switching back to syrup again whenever the former is not available.